Every week, a new Swede takes over the country's official Twitter account @sweden. It's a glorious social experiment that is largely uncensored. The account just celebrated three years last month. That's over 150 Swedes who have spoken for the country. Every week is a little bit different, but they can usually be placed in two categories: those who talk about fika and meatballs and those who talk about not talking about fika and meatballs. This past week was someone who talked about not talking about fika and meatballs. So edgy. So different. So predictable. The curator, that's what Sweden calls them, curators, had had an entertaining week with some entertaining and interesting posts. Mostly proving how not stereotypically Swedish he was, but still, entertaining. But he really stepped up his game on his last evening as @sweden. Philip Wildenstam tweeted out the cartoon depiction of Muhammad as a roundabout dog by Lars Vilks. Like I said, so edgy. So different. But not predictable. 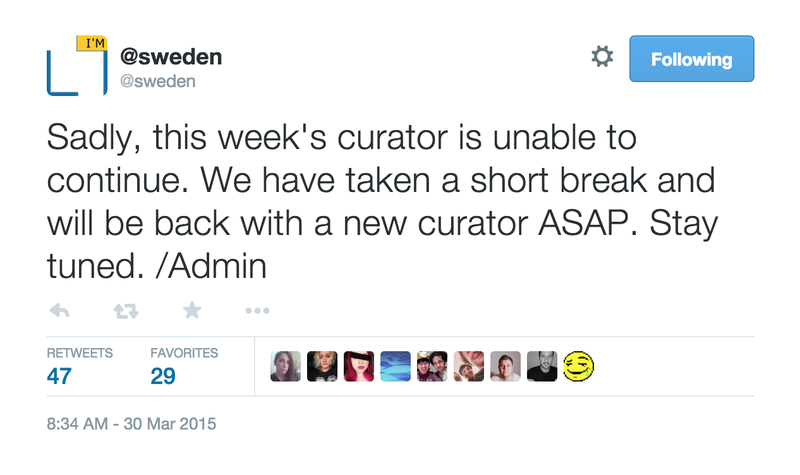 There have been some questionable tweets by the curators. A couple of years ago, one curator was accused of anti-Semitism. But, despite claims that Sweden stifles freedom of the press, freedom of expression, freedom of speech, all those freedoms, the tweets live on and @sweden is represented by a host of Swedes. And then that Vilks picture happened. Of course, Vilks is the guy who has dealt with several murder attempts due to his depiction of Muhammad. Most recently in Copenhagen. He's currently being followed by bodyguards everywhere he goes and recently said to Expressen "Jag kommer aldrig hem igen. It's over." It's the first time in years that the account has been quiet. But it's not quiet because someone broke the rules or because Sweden hates freedom. In fact, according to SVT and Expressen, it's quiet because the woman who had taken over after Wildenstam was so nervous of being attached to the cartoon by Vilks that she chose to leave the account. This even after Svenska institutet chose to delete the tweet in question. SI specifically stated that no one broke any rules. That's especially true because Wildenstam claims the cartoon was tweeted out in context. A context that focused on freedom of the press. There's probably some sort of irony in there somewhere. I don't do irony. Obviously. But it also matters because there's a lot of misinformation floating around. 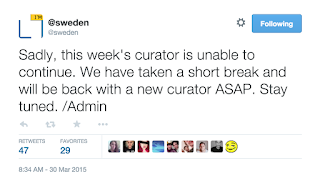 The @sweden thread was filled with accusations of censorship and rumors. For an account that has been so incredibly media savvy, groundbreaking, and damn cool, it was a surprisingly awkward way of handling the situation. Aside from the tweet above, there's been nothing in English to explain the sudden inactivity. And that's not good, because for an account that aims to reach non-Swedes, the Swedish language is a bit of a barrier. Which leaves over 83 000 @sweden followers staying tuned. For something. Welcome to Sweden. And Twitter silence.